The English Building was designed by architectural firm, McKim, Mead and White. Built in the Beaux-Arts style, the building was completed in 1905. It is located in Urbana on Wright St.
Later on in 1937, the purpose of the building discontinued as a women’s dormitory. 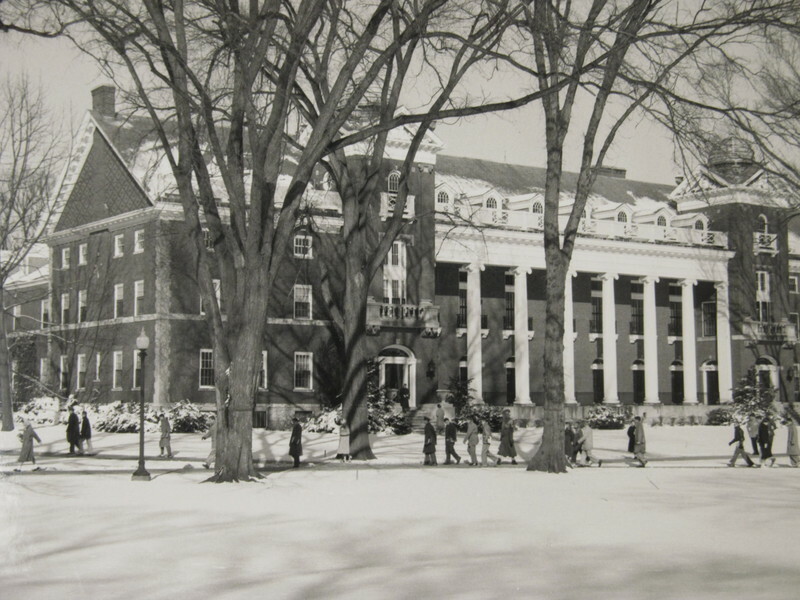 By 1942, the Woman’s Building became the Department of Physical Education for Women. Also, parts of the building were being apportioned for other purpose and use, such as the lower gymnasium of the building being selected as the new location for the W.I.L.L. radio station in 1941. 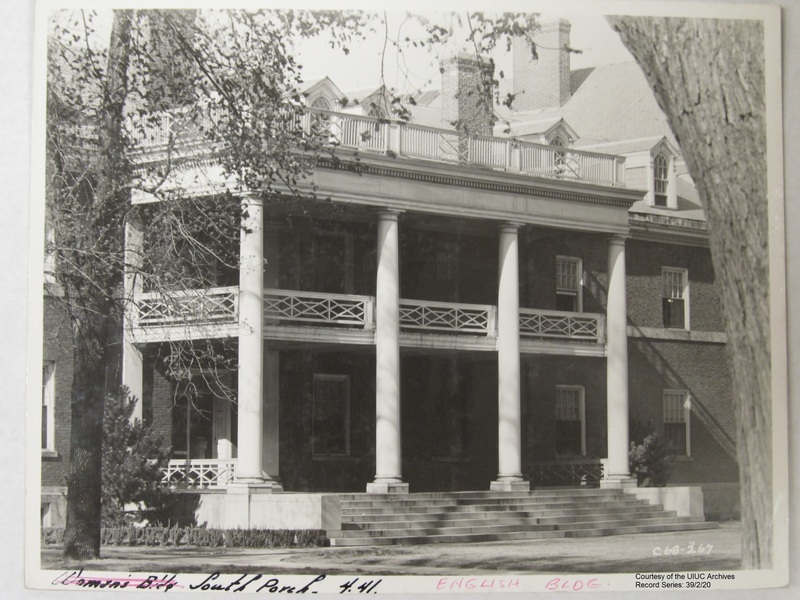 In 1946, the rest of the building largely housed the Home Economics Department and on June 27 of the same year, the Board of Trustees gave permission to the Executive Committee of the College of Agriculture to rename the building as Bevier Hall. 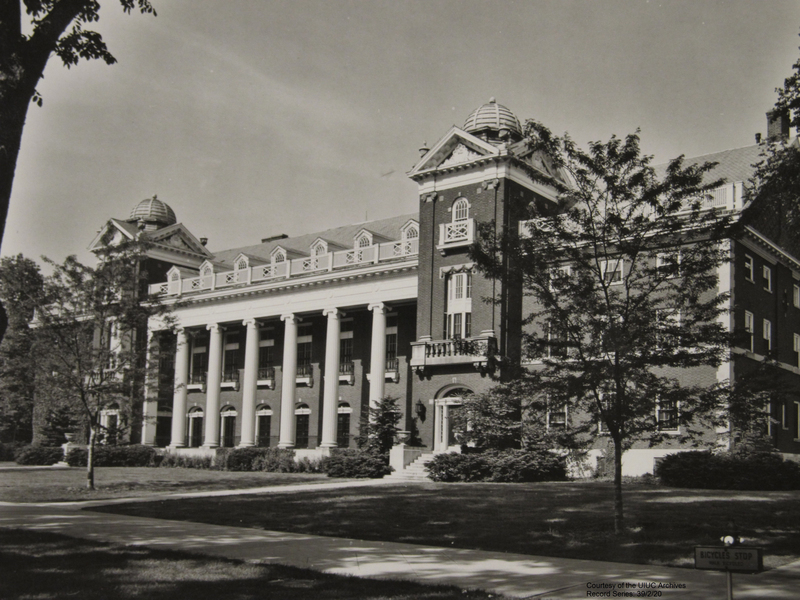 In 1956, the new Bevier Hall had been constructed and the English Department had taken over the old building, leading to its renaming as the English Building. The “Woman’s Building” had the original purpose of a woman’s dormitory back when it was built in 1905. 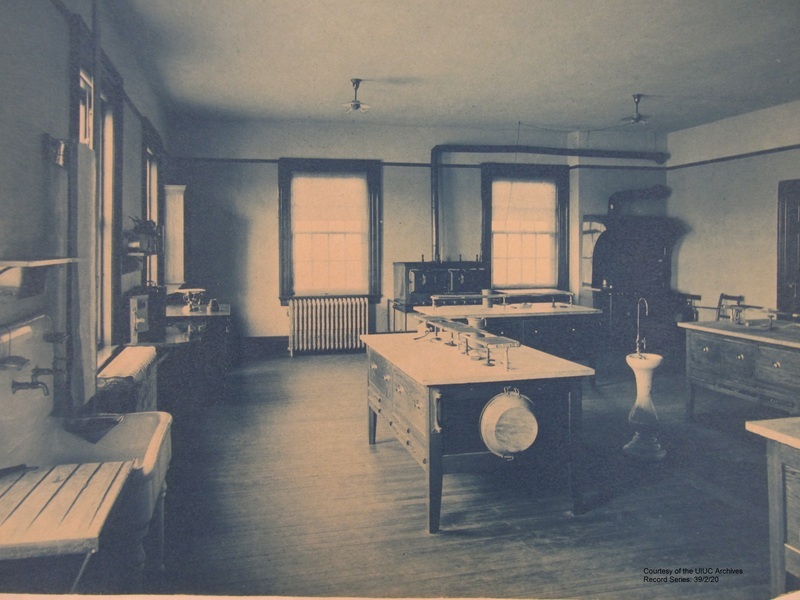 It housed a pool, chemical laboratory, practice kitchens, a large gymnasium, and other rooms that were mainly used by female students in the early 1900’s. The exterior façade of the building was styled after the Beaux Arts, which expresses an academic neoclassical architectural style that originated in Paris. This style inspired most architectural design in the United Stated in the period from 1880 to 1920. The Woman’s Building, now the English Building, has an exterior design with the Beaux Arts architectural style with red brick, white stone exterior featuring dormer windows and a central colonnade flanked by twin towers. The towers are topped with low-rising domes with pineapple spires. The interior of the building contained three floors, along with a basement. 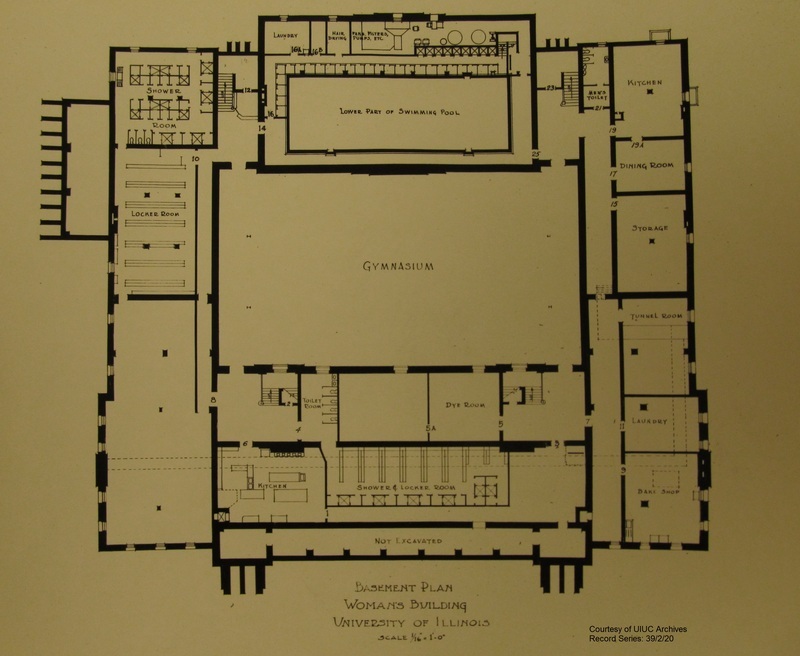 The basement and first floor had a large double height gymnasium that was located in the center of the two floors. 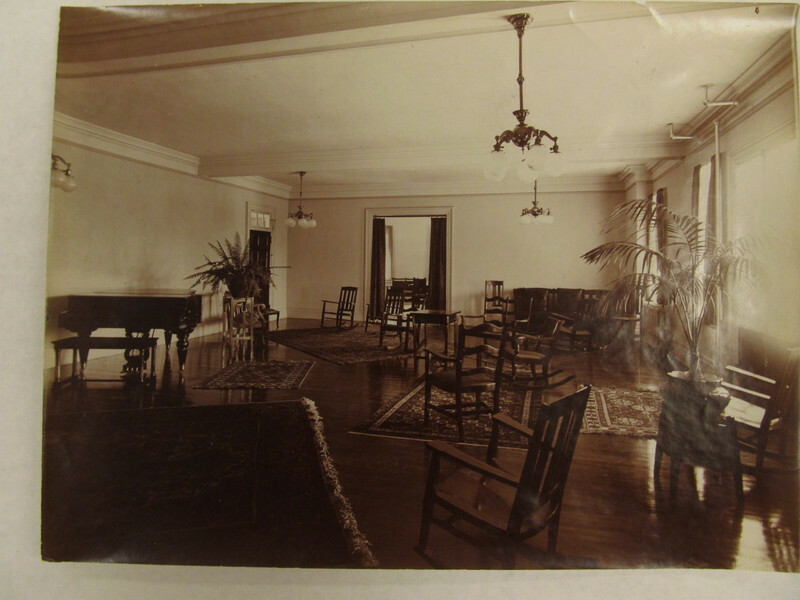 The firm that designed the English Building was called McKim, Mead, and White. This was a leading American architecture firm, founded and created by Charles McKim, William Mean, and Stanford White who created memorable Beaux-Arts architecture in the United States. McKim was educated at Harvard and was known as an American architect of primary importance in the American Neoclassical revival. White, also an American architect, was the most imaginative partner in this firm. Last but not least of the three was William Mean, who was partially responsible with McKim in creating this firm that was very popular and prolific in the United States. The success of the firm was due in part to the three partners being able to work so well together, with McKim being the idealist, Mead the pragmatist, and White the sensualist. McKim’s idealism and likeness to universal ideas were shaped by the example of his father, a leading activist and fundraiser for the abolitionist cause. Mead was the realist of the trio. White was the firebrand, eager to experiment and use new materials. The high professional ideals of both McKim and White were developed during several years as assistants in the office of Henry Hobson Richardson. The background of these two allowed them to bring specific and identifiable strengths to the partnership. McKim was a designer with a good understanding of early American buildings and decorative arts, a powerful ability to simplify forms, and a social network well-developed. Between 1879 and 1912, McKim, Mead, and White became the largest and most important architecture office in America with a staff that grew to over 100, making the firm a model for the modern architectural practice. During its first thirty years, the firm raked in and completed close to one thousand commissions, qualified as leaders for the movement to introduce classical order to American cities, trained the next generation of architects, and were awarded the Gold Medal of the Royal Institute of British Architects. 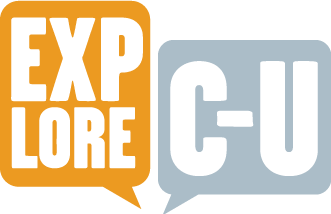 Han-Chiang Chen , Kristina Werner, and Mo Shen, “English Building,” ExploreCU, accessed April 20, 2019, https://explorecu.org/items/show/293. Charles Follen McKim (American Architect)." Encyclopedia Britannica Online. Encyclopedia Britannica, n.d. Web. 05 Nov. 2013. http://www.britannica.com/EBchecked/topic/354929/Charles-Follen-McKim Leetaru, Kalev. 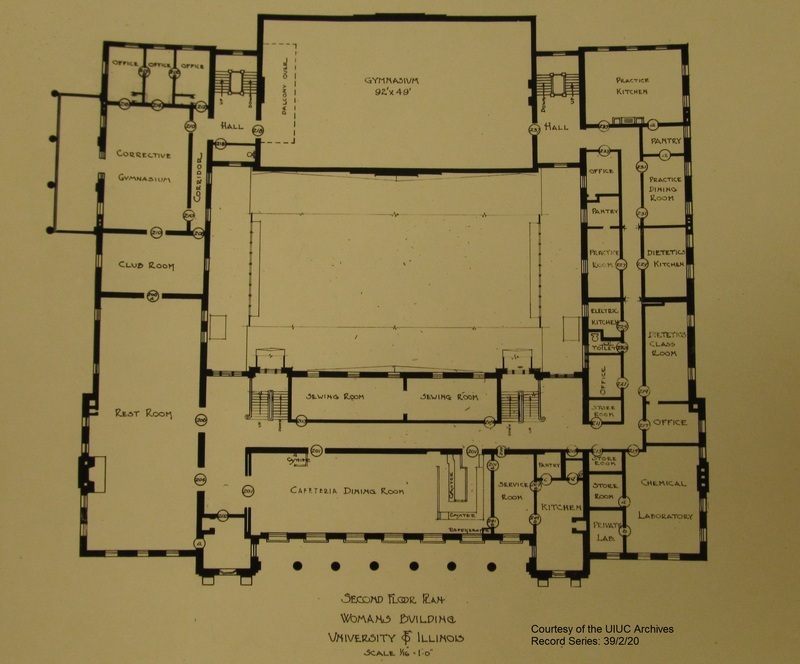 Woman’s Building/Bevier Hall/English Building: UIHistories Project: A History of the University of Illinois. 2004. Web. 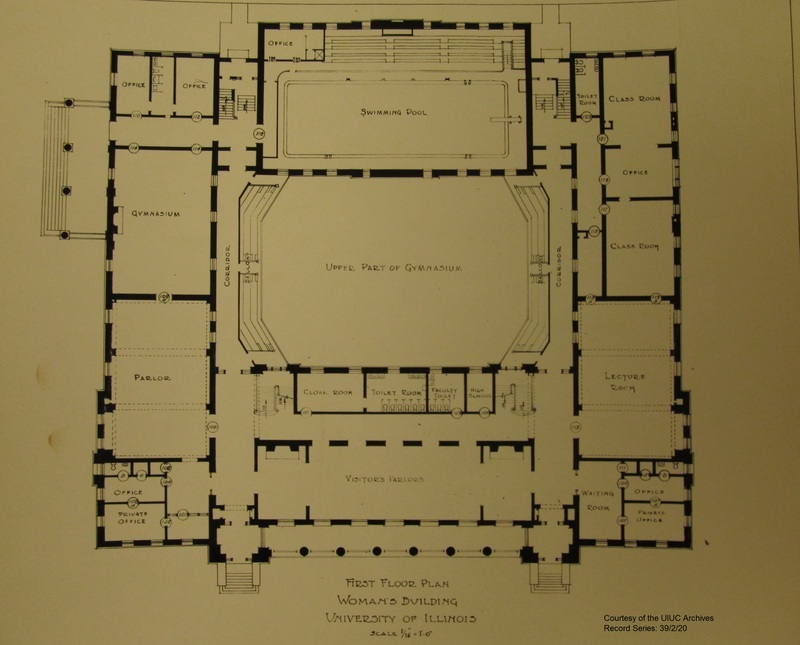 14 Nov. 2013. http://uihistories.library.illinois.edu Weller, Allen S. 100 Years of Campus Architecture at the University of Illinois. University of Illinois Press 1968.